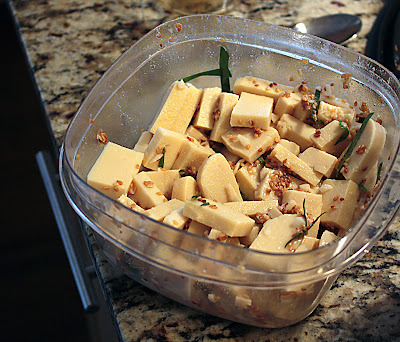 My son and his girlfriend made a large batch of Shan tofu and shared half of it with me. 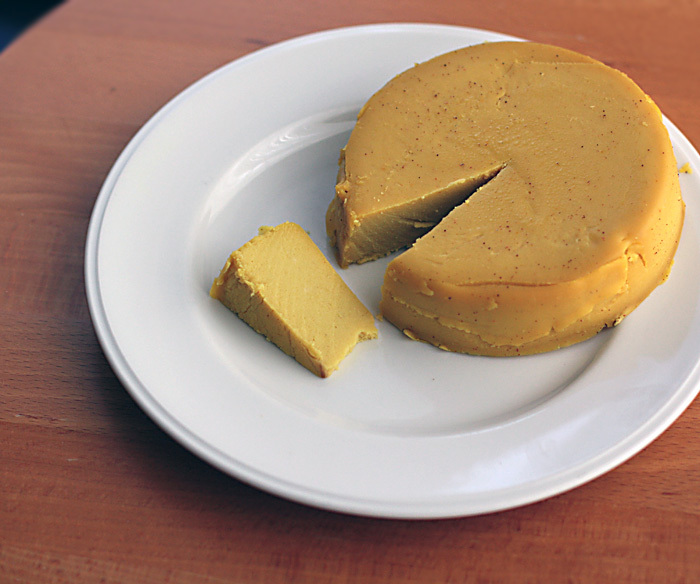 Shan tofu is also known as Burmese tofu, and is made primarily from chickpea flour. That may sound unappealing to you but it tastes great and is very versatile, not to mention easy to make, though it does require some waiting. The tofu they gave me had been made into shan tofu salad with the addition of kaffir lime leaves, toasted sesame seeds, garlic and a few other ingredients. The texture is different, of course from soy-based tofu; I've seen it described as being similar to refrigerated polenta, but that's not quite right. 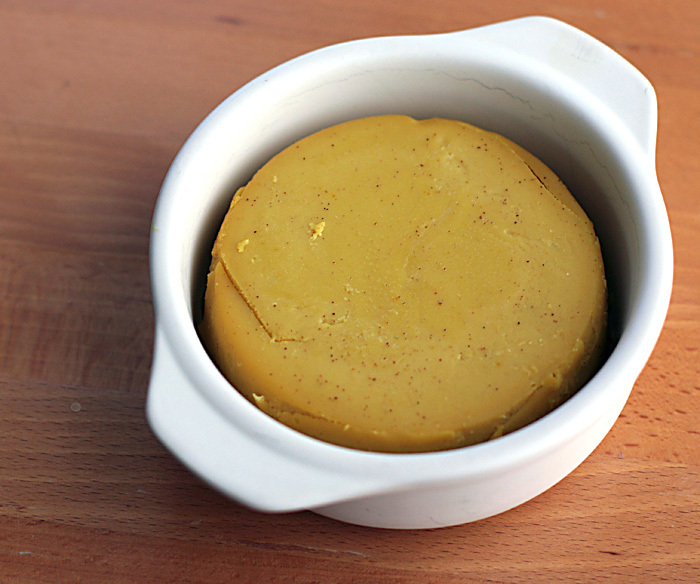 It's firmer than polenta and just ... different. Maybe you just have to try it to know what it's like. For breakfast over polenta, with olives, tomatoes, pumpkin seeds, hemp hearts. The recipes used for the tofu and marinade came from Burma: Rivers of Flavor by Naomi Duguid. I searched the Internet hoping to find the exact recipes to share with you, but came away empty-handed, and I can't share copyrighted material. On Amazon, you can "look inside the book" to get a taste for the wonderful recipes and photos, and see the recipe for Shan tofu salad, but not for the tofu itself. The book is not vegetarian or vegan, but substitutes for things like fish sauce and shrimp paste are suggested, and there are so many interesting recipes I think I'd love to have the book in my collection. 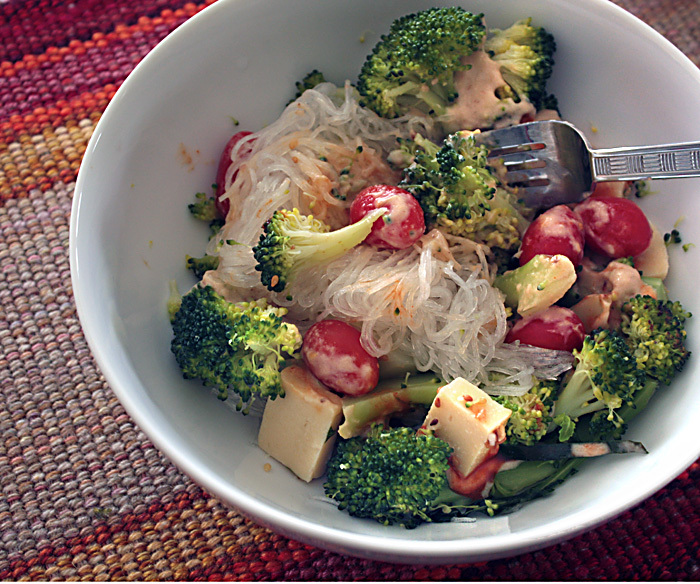 With broccoli, tomato and umeboshi-tahini sauce over mung thread noodles. There seem to be two basic ways to make Shan tofu — the traditional way and the modern way. The traditional way involves soaking chickpea flour for a number of hours in a large quantity of water, removing some of the water, cooking the mixture, then letting it firm up in the refrigerator. The modern method eliminates the soaking period and cooks the flour with a lot less water before the firming-up stage. Shan tofu added to a mixed-greens, tomato and sunflower seed salad. I was able to find many links to recipes for the traditional method, and am sharing my favorite — a very clear youtube video. I also found a link to a recipe very similar to the modern one in my son's cookbook, though the cookbook version uses only chickpea flour, water and salt in somewhat smaller quantities than the linked recipe. (It's possible that the oil in the linked recipe is added to help keep the mixture from foaming up when it's cooked.) I think I'd make half a recipe, because even the smaller quantity from the cookbook made a LOT. I haven't tried making this myself yet because I had such a huge amount to use up, but I intend to try it soon, and if I run into any issues I'll update the post. I also haven't tried Shan tofu in its natural state — only marinated in the salad dressing, which I think was a great way to flavor it. It can also be added to a soup or stir-fry, or deep fried into a snack. Here's another recipe that's very simple. Have you tried Shan tofu? If you've never read this post, you should. It's about facing a health crisis as a vegan. We've all read about ex-vegans who have stopped being vegan because of a health issue. This is a story of pursuing medical help with failing health with determination and courage, while remaining vegan. After making the cheese multiple times, I finally got around to air-drying the smoked provolone from Artisan Vegan Cheese instead of just eating it as soon as it cooled. It requires patience, you know, to let it cure for two-to-three days, and I prefer instant gratification, but I really wanted to try air-drying a cheese. The smoked provolone is relatively easy to make, which is one of the reasons I like it so much, but it also tastes really great, and is perfect on crackers or even melted on nachos. Yes, even though I use agar agar and not carrageenan, it melts when I heat it, and it tastes like ... cheese. I also reduced the oil to 1/4 cup and used olive oil, and I added a pinch of turmeric. The thing that finally inspired me to air-dry a round of cheese was a little brie baker I found in a resale shop. I'd never heard of a brie-baker, but it looked like the perfect size for a cheese mold. It even had a lid. I could fit about half a recipe into it while having the other half to eat right away. The cheese filled the whole thing when it first went in, but in the photo I'm showing you how much it shrank after air-drying on the rack for two days. Here's my cheese, in a light coating of salt, drying on the rack. I have a little confession to make; I still haven't made rejuvelac — I made my cheese with filtered water. (Before I bought my cookbook, I used a sample recipe that said, "rejuvelac or water," but I can't remember where I saw it and I can't seem to find it.) I still plan to make rejuvelac because I want to make the cheese the "right" way, but so far the water has worked well, though it must make the cheese milder than rejuvelac. 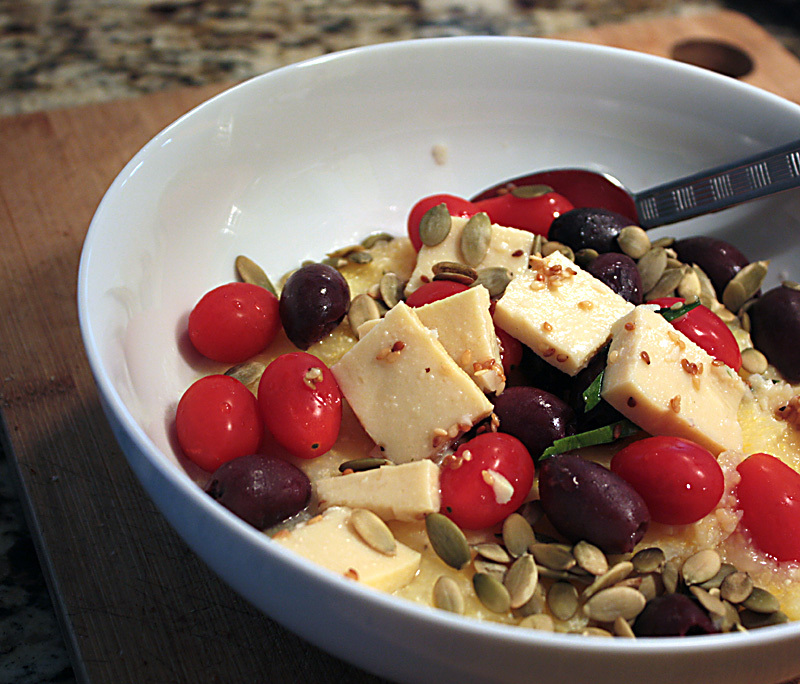 Just seeing the photos again has got me craving a wedge of smoked provolone. I'm going to start some rejuvelac TODAY! I own the Artisan Vegan Cheese cookbook, but if you don't yet have a copy and want to try out a sample recipe, look up the book on Amazon where you can look inside and see some of the recipes. 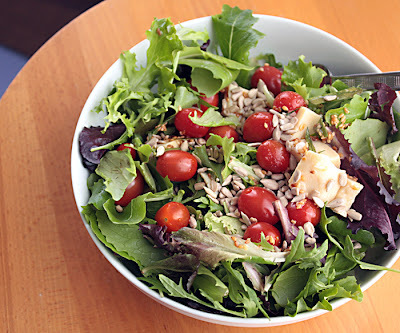 There are also a few recipes in the Sept.-Oct. 2012 issue of VegNews Magazine. 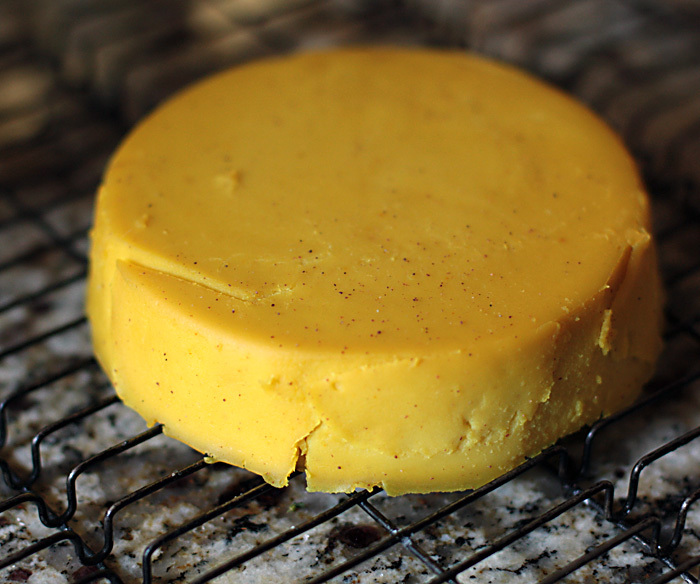 You can read cheese-making tips from Miyoko Schinner at the VegNews Web site. You can also visit Miyoko's blog, where she offers cheese-making tips as well as non-cheese vegan recipes. Even if you have the book, it's worthwhile to check the blog for updates to the recipes. I actually like the vegan cheeses better than I ever liked dairy cheese. Go figure. Miss E, my wonderful granddaughter, was born on Valentine's Day, and yesterday was her 5th birthday. I baked her a banana chocolate chip cake with chocolate ganache, and delivered it to her her house. While I was there hanging out with her, her parents and her brand new brother, her Mom told me that earlier in the day Miss E's Papa had taken her to the co-op to pick out two things to be part of her birthday dinner. Did I want to see what she'd chosen? Uh oh ... Miss E doesn't have just one giant sweet tooth — she has a mouthful! And there's a snack monster in her pocket that "makes" her consume more snacks in a day than I eat in a month. I was having a little trouble imagining what two things she'd pick that could be made into dinner. Her Papa told me she'd perused the entire store very thoroughly before selecting her two items, and what were they? She grabbed a bag of organic Brussels sprouts and an artichoke! Who wudda thunk it? Good job, Miss E! I guess roasted Brussels sprouts hit the spot even with picky eaters.